Kepler‘s final image (shown at top), taken on Sept. 25th, 2018, represents the “last light” obtained by the space telescope. The blackened gaps in the center and along the top are the result of earlier random part failures in the camera. However, these did not affect the rest of the instrument, nor did they interfere with Kepler obtaining this last glimpse at the cosmos. It also comes nine and a half years after Kepler began its exoplanet-hunting journey with its “first light” image (shown above). This image was the result of a 60-second exposure taken on April 8th, 2009 – one day after the spacecraft’s dust cover was jettisoned – and featured a full-field view of a patch of sky in the constellations Cygnus and Lyra. The “last light” image was part of Kepler‘s final observation campaign, which was part of its “K2 Second Light” mission extension. 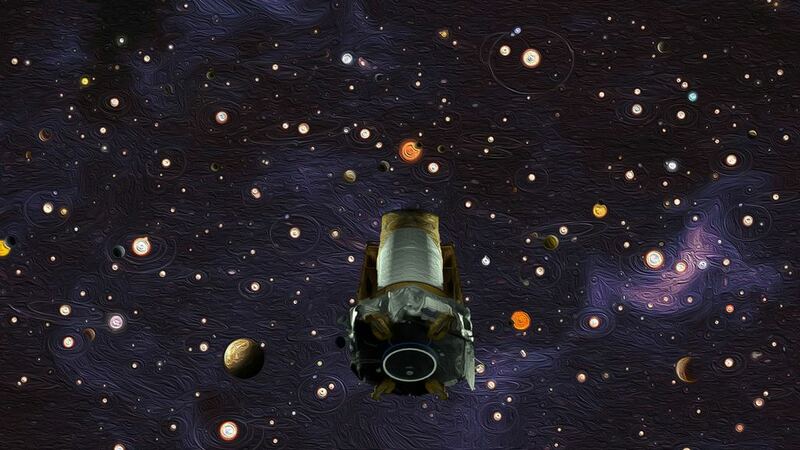 This mission commenced in 2013 and lasted right up until the last of Kepler‘s fuel was expended. For this campaign, Kepler was pointed in the direction of the Aquarius constellation, where it caught sight of some renowned star systems. During this final observation, Kepler’s field of view also slightly overlapped with NASA’s new planet-hunter, the Transiting Exoplanet Survey Satellite (TESS), which took to space in April of 2018. As the successor to Kepler, this space telescope will similarly rely on Transit Photometry to search for thousands of exoplanets around 200,000 main-sequence dwarf stars. In addition to the static snapshots, Kepler’s camera also recorded 30-minute segments of selected targets. The purpose of these recordings was to measure the brightness of the stars, which is essential for not only detecting transits by exoplanets but also understanding key aspects of stellar behavior. The recording continued several hours after the “last light” image was taken and all data collection ceased. This final image and recordings represent the final page in the final chapter of Kepler‘s journey, which began nine and a half years ago and revolutionized exoplanet studies. In total, Kepler discovered almost 4000 planetary candidates beyond our Solar System, confirmed the existence of more than 2,600, and statistically demonstrated that our galaxy has even more planets than stars. In the coming years, Kepler’s work will be followed up by many next-generation telescopes. These include TESS, which has already launched, as well as the James Webb Space Telescope (JWST) and the Wide-Field Infrared Survey Telescope (WFIRST) – which are scheduled to launch in 2021 and the mid-2020s. To all team members: thanks for your service.